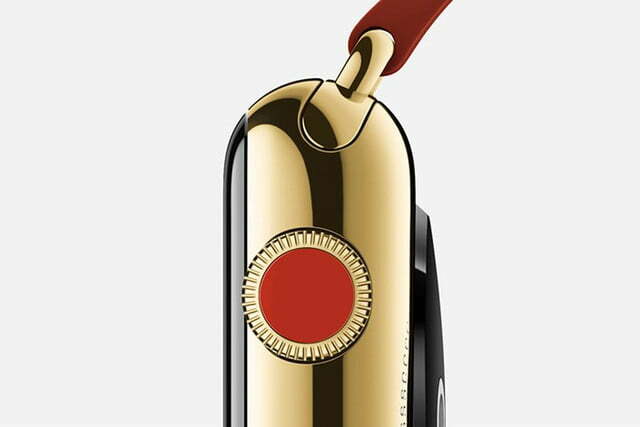 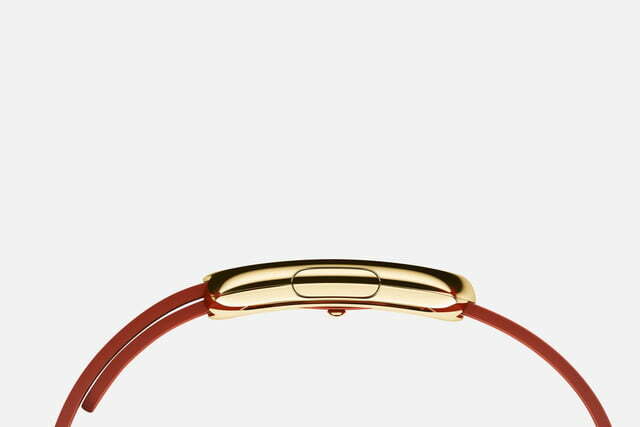 Apple’s long-rumoured move into wearable technology has finally taken place. 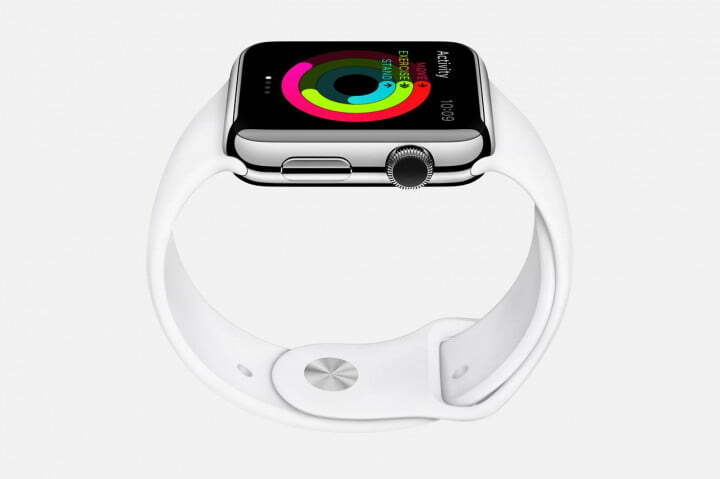 At the firm’s first major new product launch event of 2014, the Apple Watch was revealed on stage by CEO Tim Cook – as an iconic “one more thing” – alongside the brand new iPhone 6 and iPhone 6 Plus smartphone range. 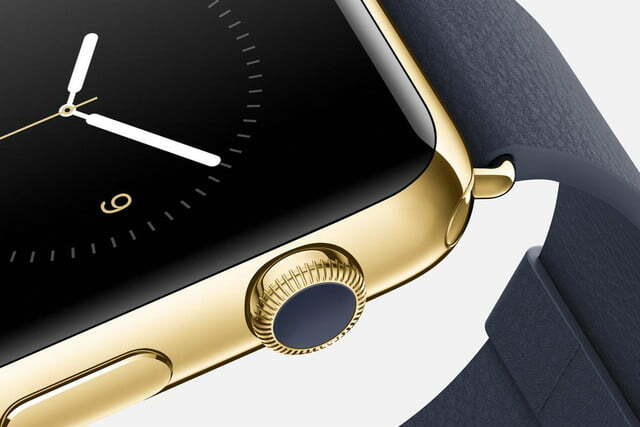 While the iPhone 6 has been systematically leaked over the past year, the Watch has stayed hidden from view, making the final design and spec list a genuine surprise. 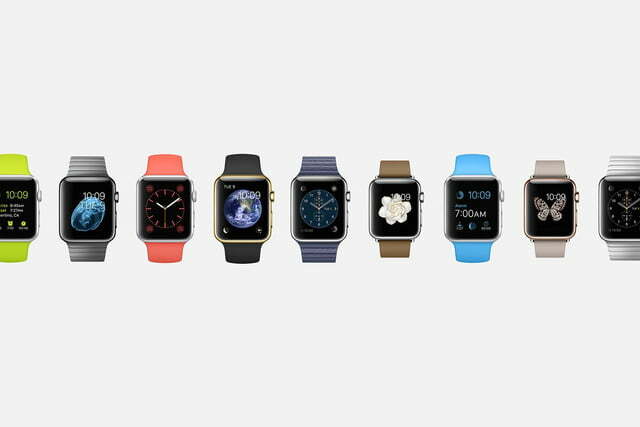 The smartwatch industry has so far been fixated on producing one smartwatch for everyone, but Apple will make both a large, 42mm Watch, and a smaller-faced 38mm Watch. 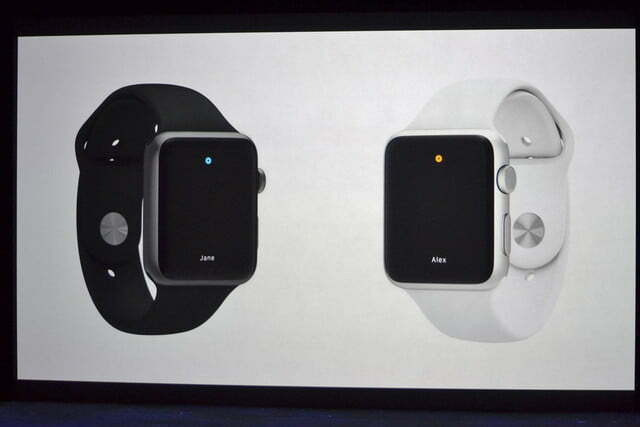 There will be three different versions, each available in two finishes. 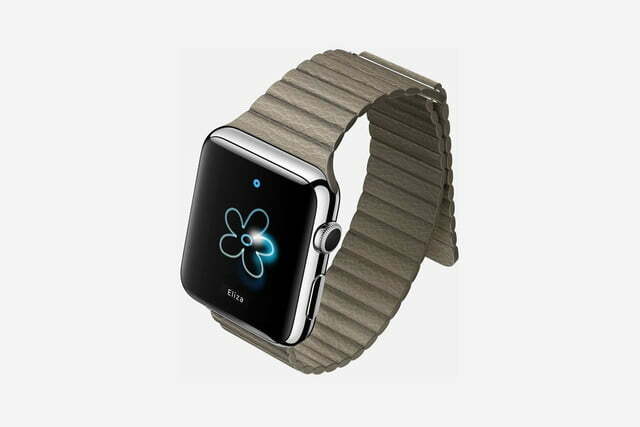 The first is known simply as the Apple Watch, and it comes with a polished case made from stainless steel, and a choice of steel or space black finishes. 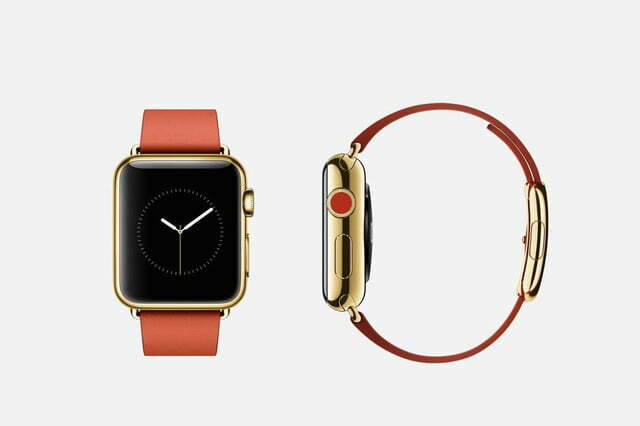 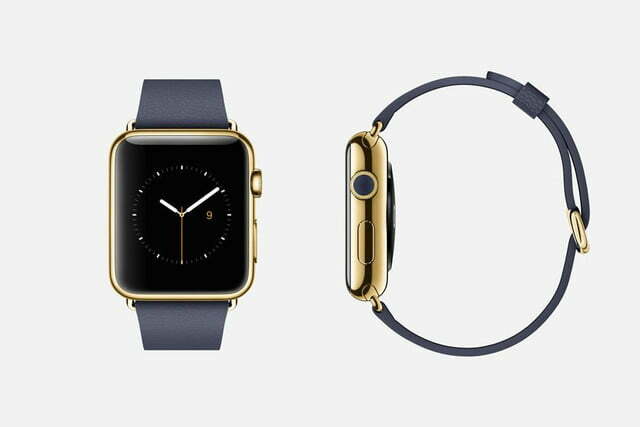 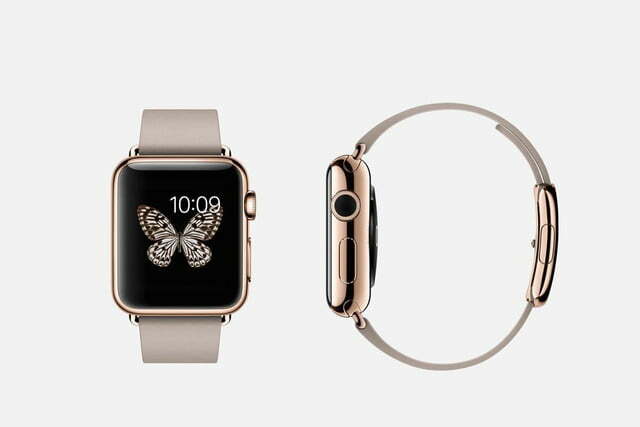 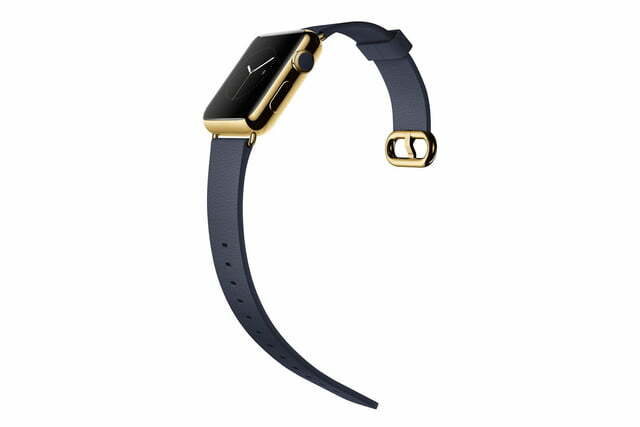 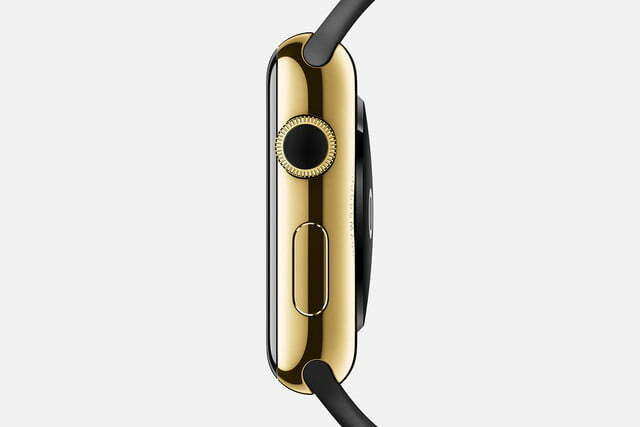 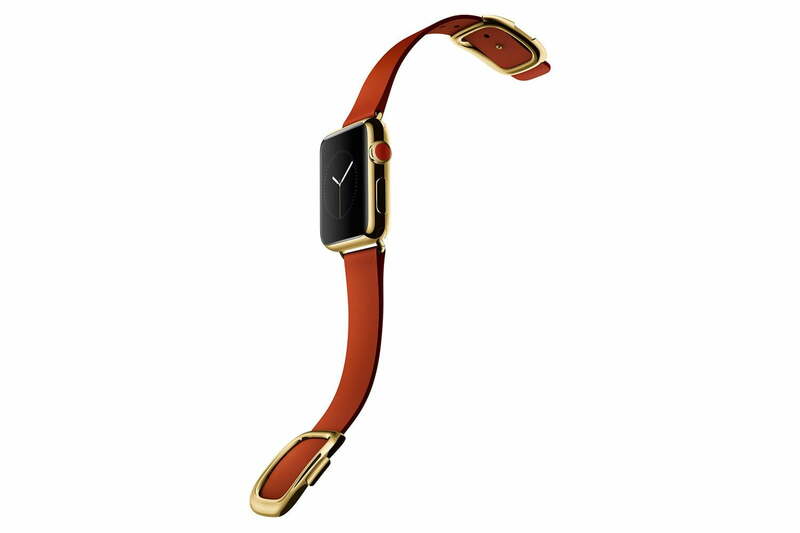 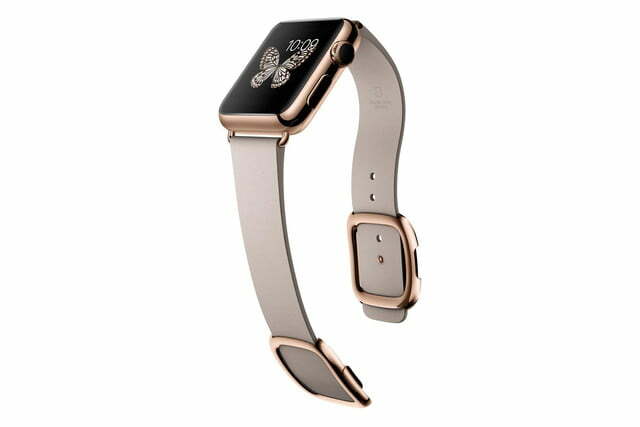 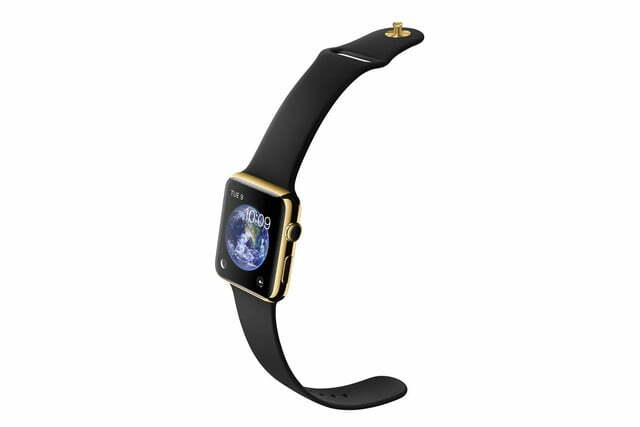 Next is the Watch Edition made from 18k yellow or rose gold. 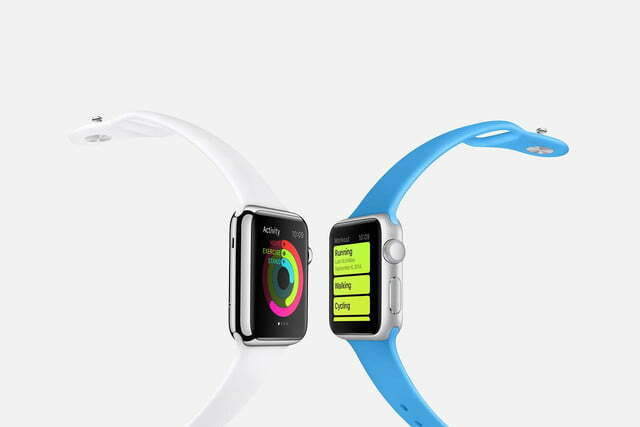 Both these have scratch-resistant, anti-reflective sapphire crystal glass screens. 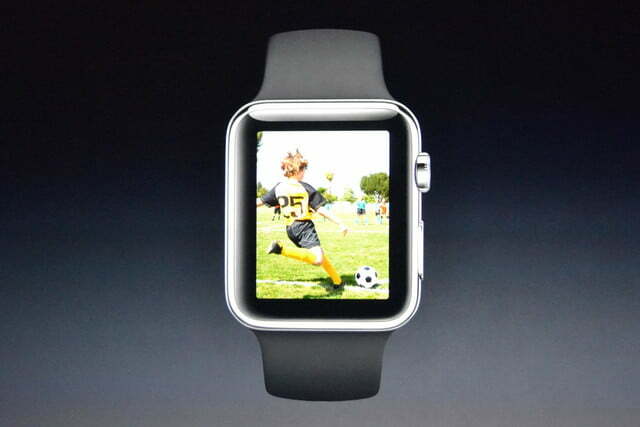 However, the Watch Sport doesn’t, and instead has a lightweight, scratch and impact resistant, Ion-X glass screen. 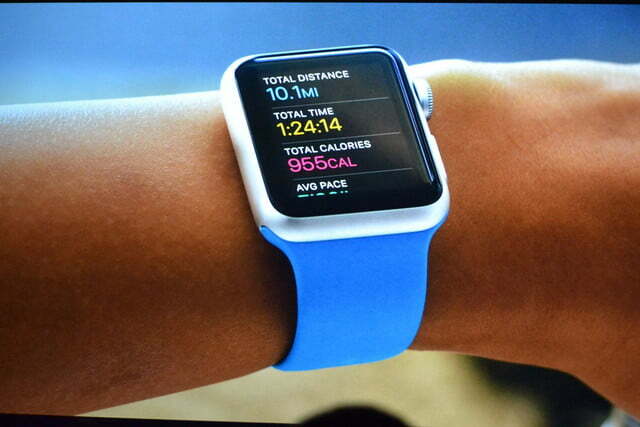 The body is made from anodized aluminum. 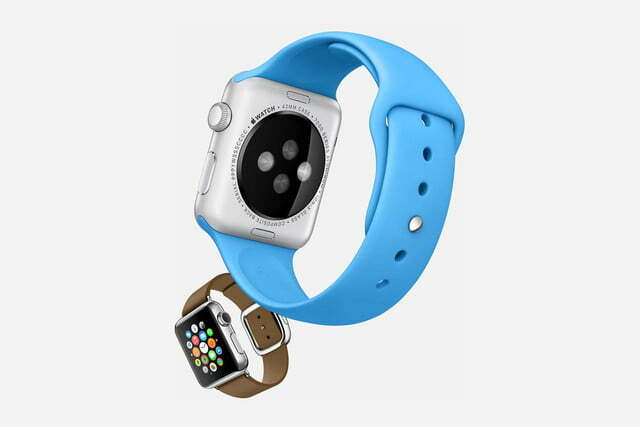 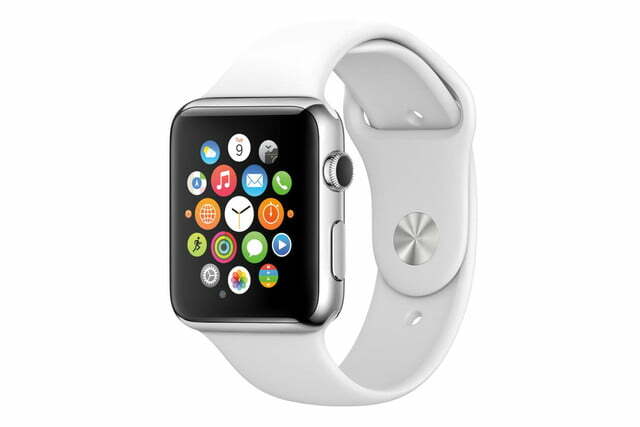 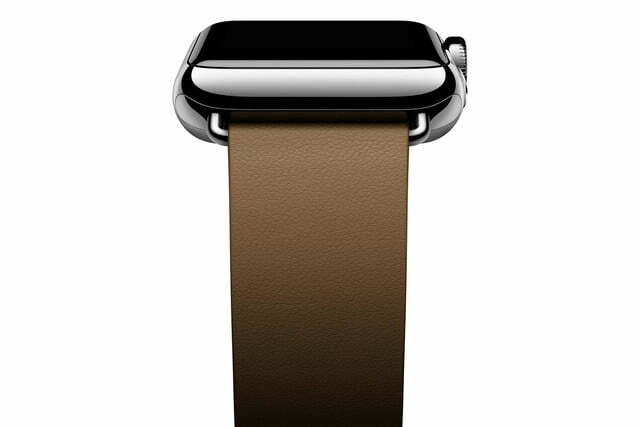 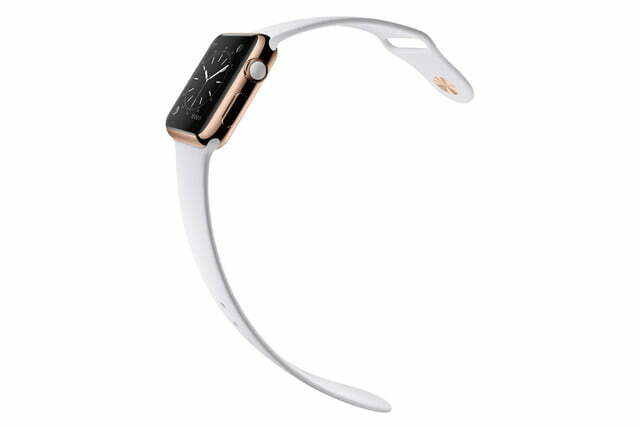 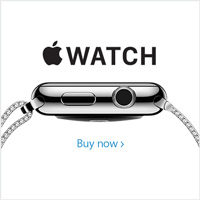 A large range of interchangeable watch straps mean the Apple Watch can be personalized by the wearer. 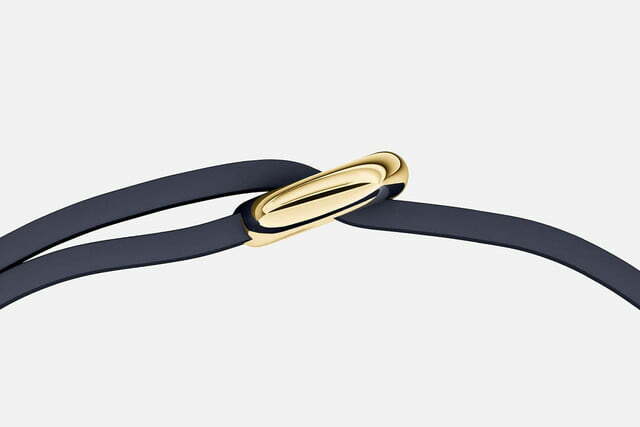 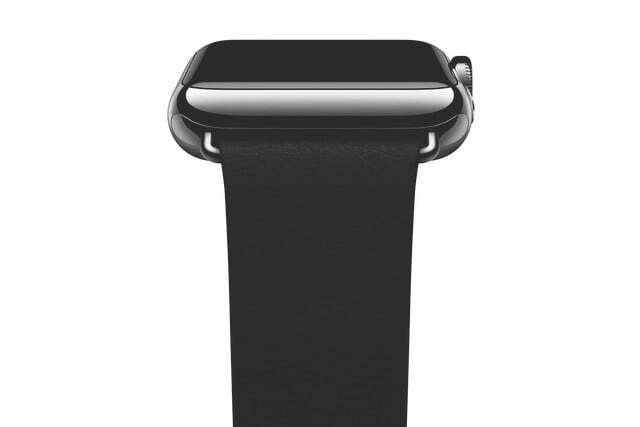 These range from a stainless steel metal link bracelet to a fluroelastomer flexible strap, and classically styled leather bands too. 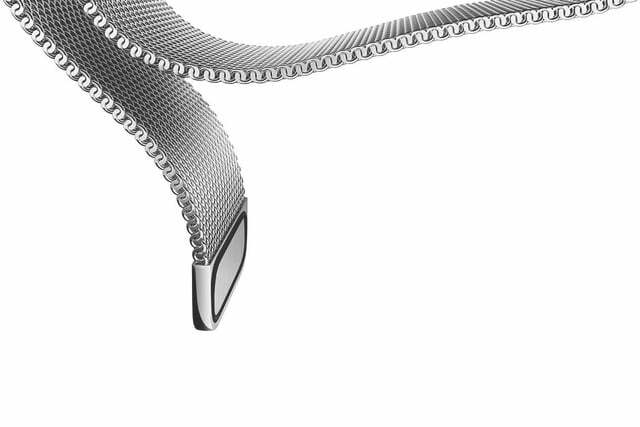 Each has its own unique fastening, which in several cases uses magnets to hold the strap closed. 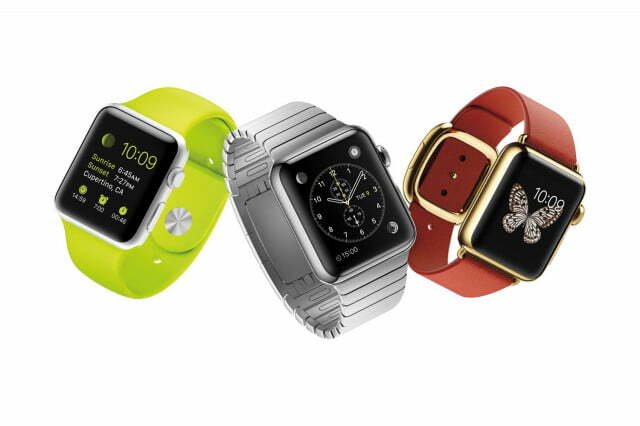 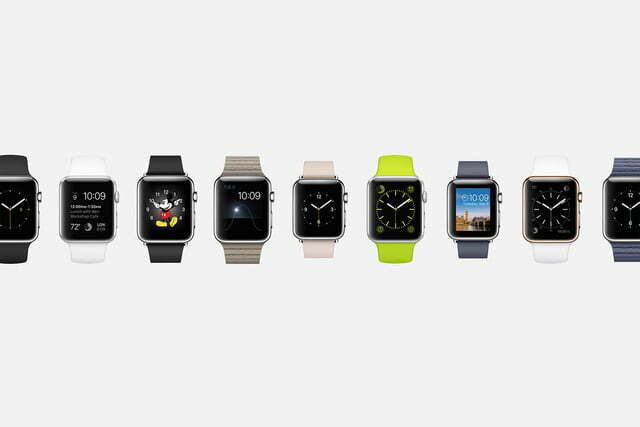 Apple advertises a dizzying 18 different styles for the Watch, ten for the Watch Sport, and six for the Watch Edition. 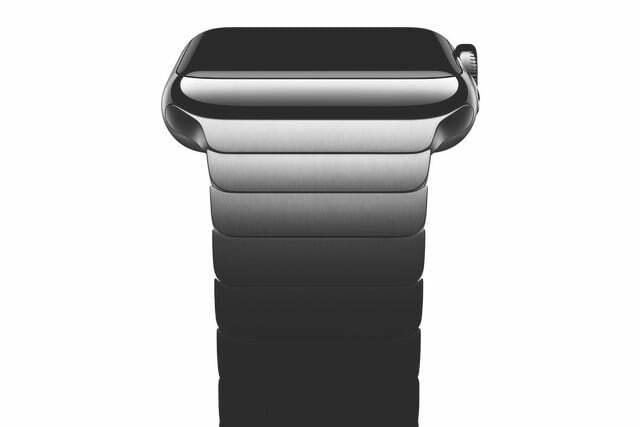 It’ll be easy to change the bands depending on your environment too, thanks to a clever – but non-standard – system on the Watch’s face. 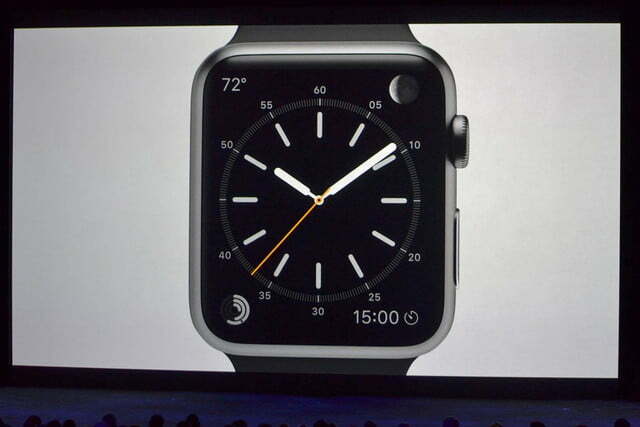 Changing the way the Watch looks continues with the face. 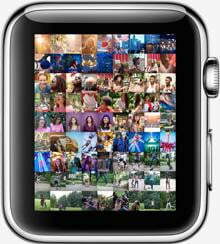 There are eleven options shown on Apple’s Watch preview website – some show your photos, others the solar cycle, the moon phases, or even Mickey Mouse – and each has individually customizable elements, alternative color schemes, and specific features. 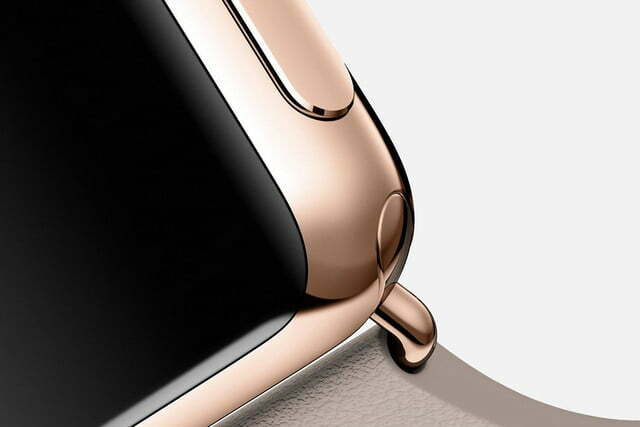 Apple has utilized the crown on the side of the Watch, which it calls the Digital Crown, turning the traditional twisting movement into a new way to control lists, zooms, and more. 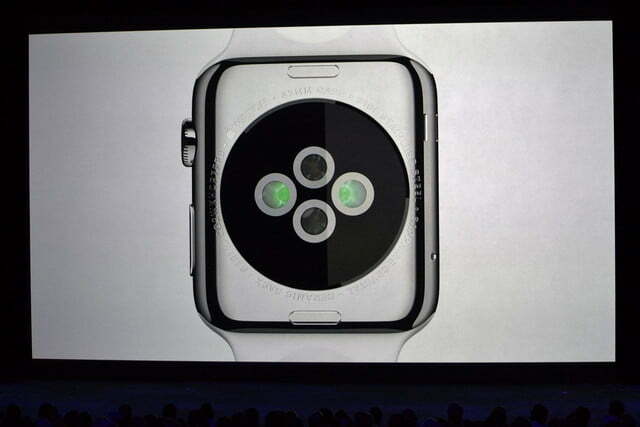 The watch senses you’re raising your wrist and turns on the display. 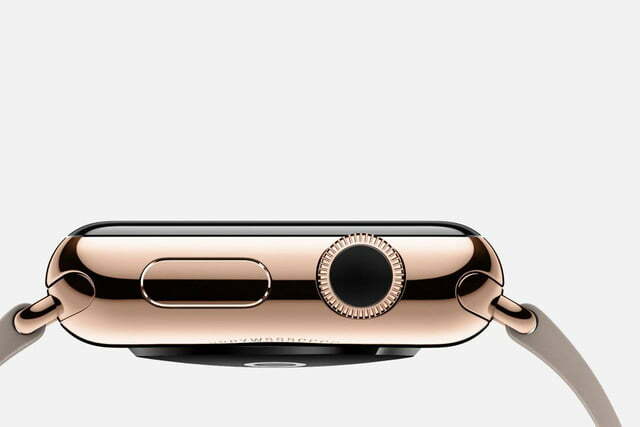 It features a pressure-sensitive touchscreen, which can tell the difference between a tap and a press – a feature Apple calls Force Touch – giving a “right click” style alternative control system for displaying menus and other options. 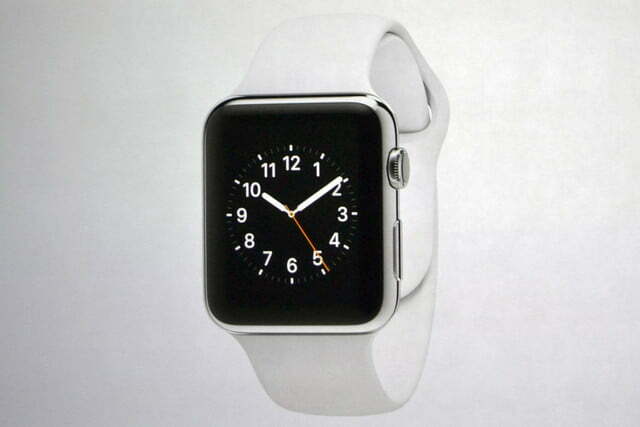 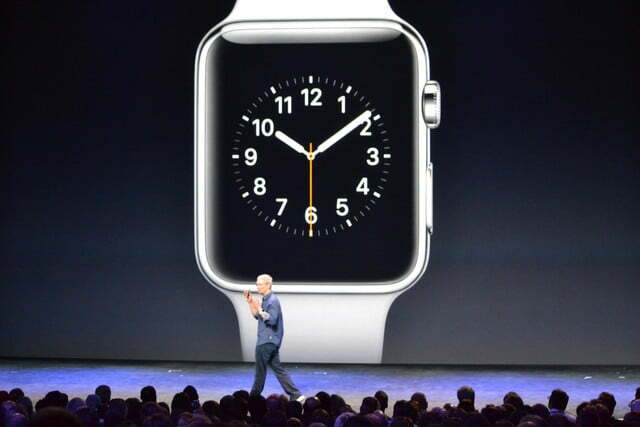 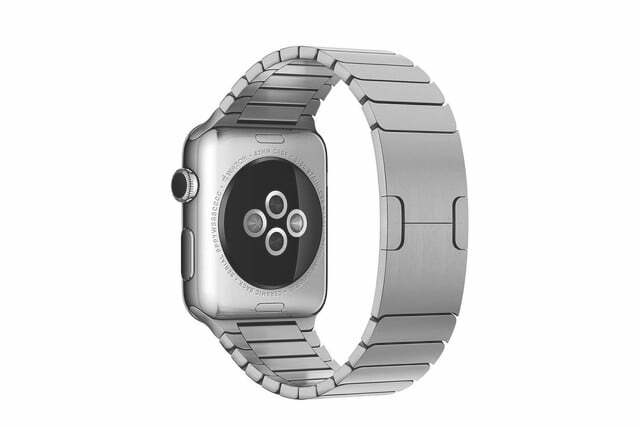 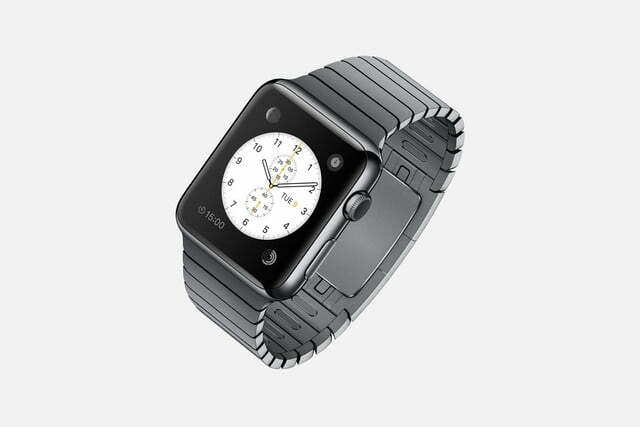 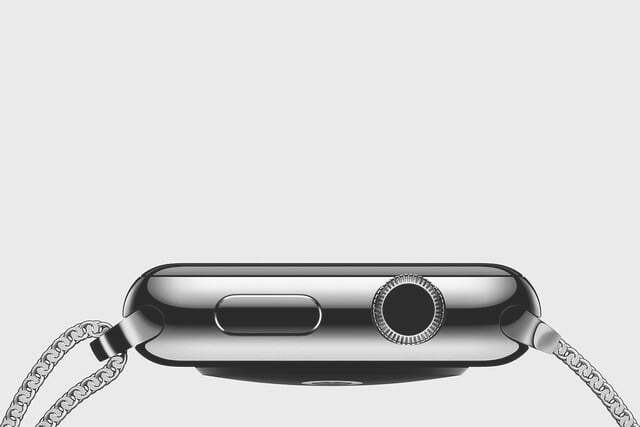 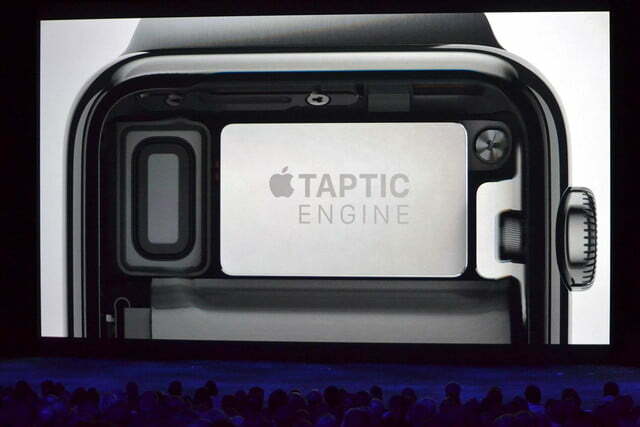 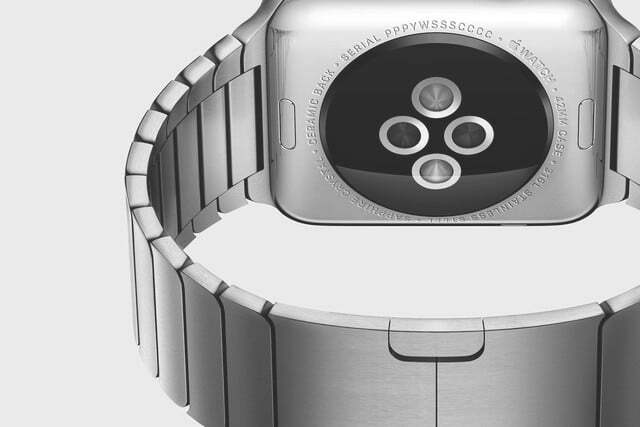 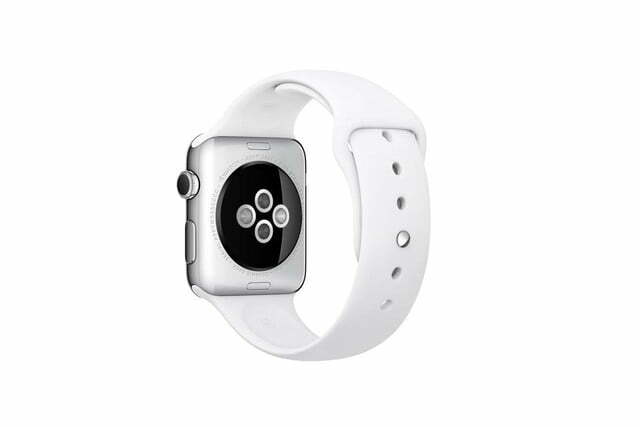 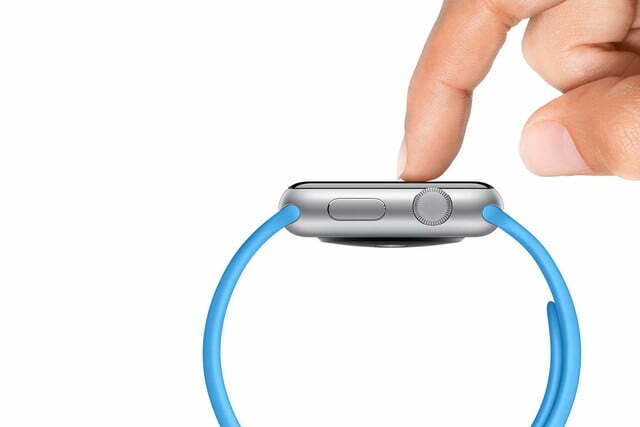 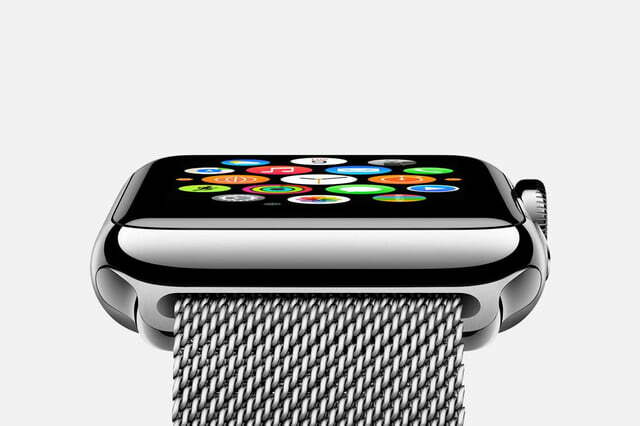 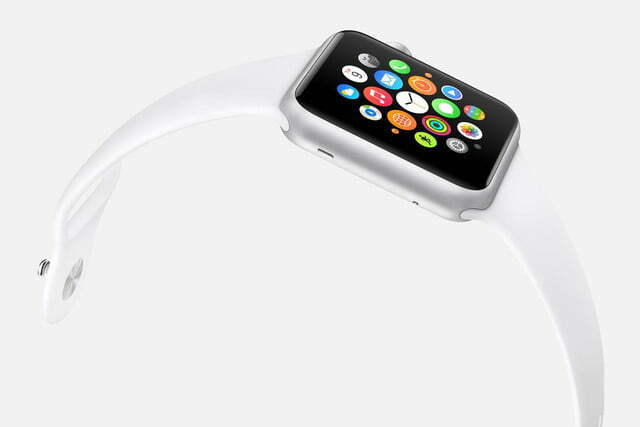 The Watch features a haptic feedback system, just like other smartwatches, which Apple has renamed the Taptic Engine. 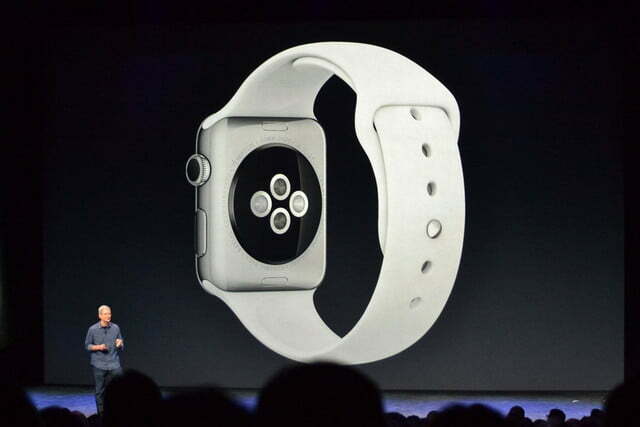 It taps you on the wrist to tell you about notifications, will vibrate when you turn the Digital Crown, and combine with subtle audio alerts too. 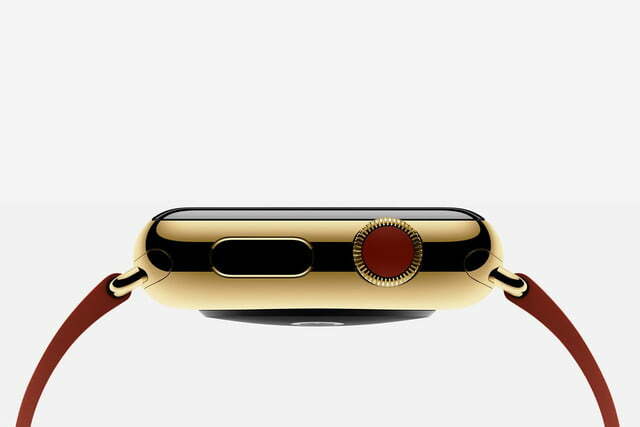 A tap can also be sent to other Watch wearers, like a digital tap on the shoulder, and the Taptic Engine will also recreate your heartbeat on another Watch owner’s wrist. 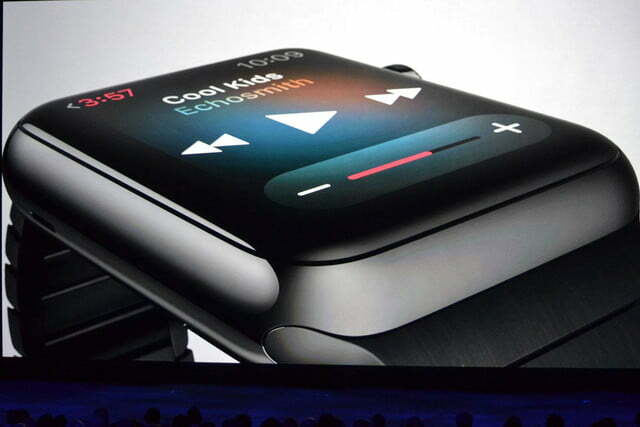 These are two aspects of Digital Touch, a Watch-only communication system where you can also send quick sketches to friends, or even directly chat to them using a walkie-talkie style app with the Watch’s speaker and mic. 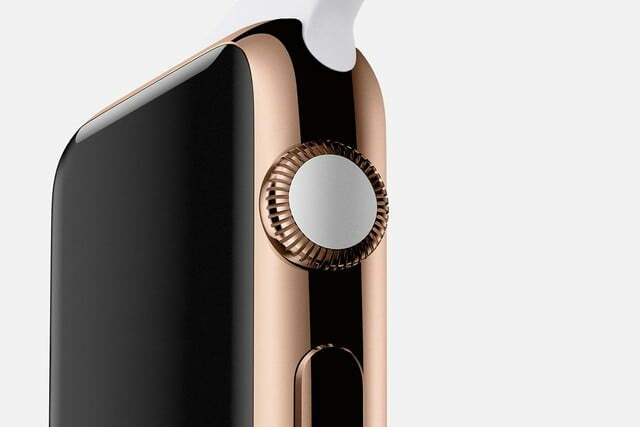 Apple uses the new, custom Apple S1 chip to power the Watch, which is safely wrapped up inside a resin bubble to protect it from water and and heavy impacts. 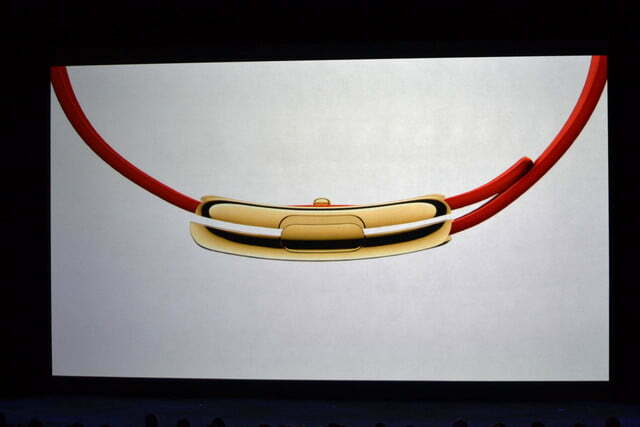 The exact specifications, and those of the screen, have yet to be revealed, and may not be finalized yet. 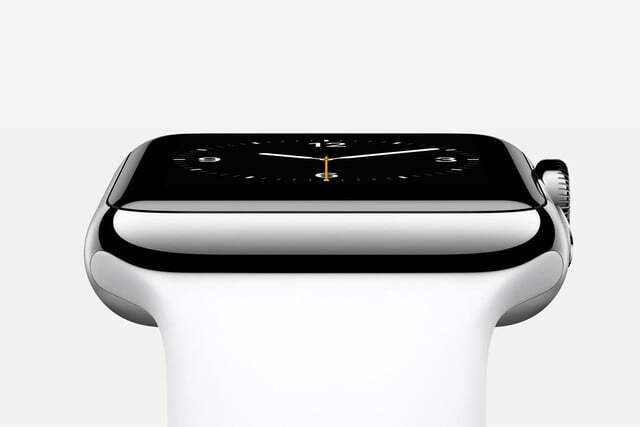 We do know it’ll come with Wi-Fi and Bluetooth 4.0 though. 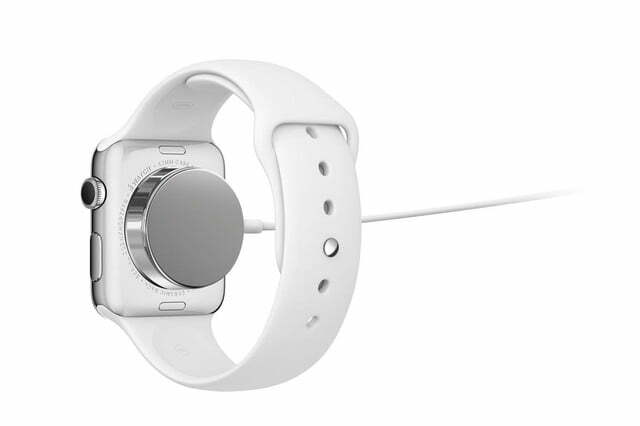 A new MagSafe charger will top up the battery using inductive charging, and it attaches the the back of the watch’s body. 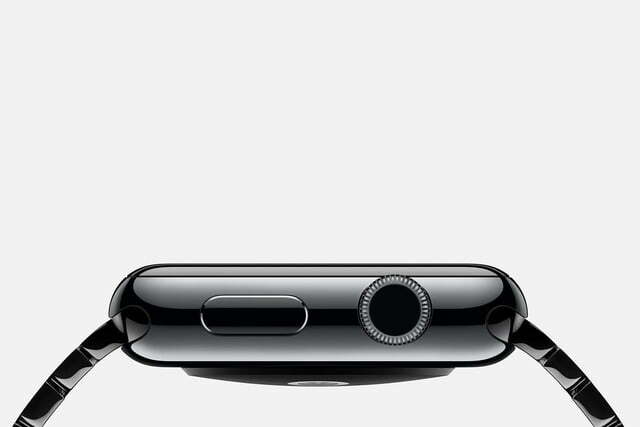 Standby time is still a secret, but Tim Cook did mention the MagSafe system would make it easier to charge the Watch every night, so we shouldn’t expect it to last more than 24 hours. 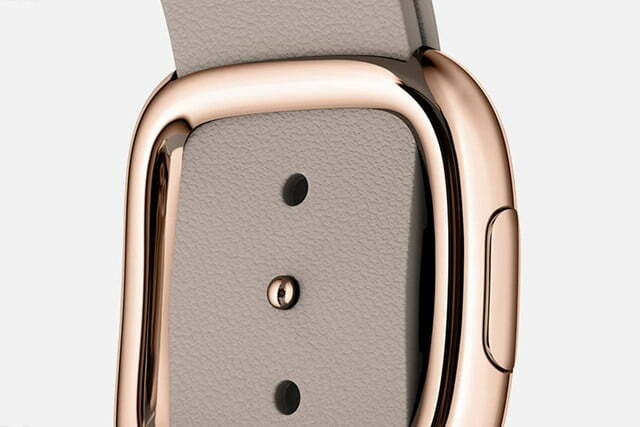 Also on the back of the Watch is a heart rate sensor, which uses a set of LEDs and photodiodes mounted in a ceramic cover. 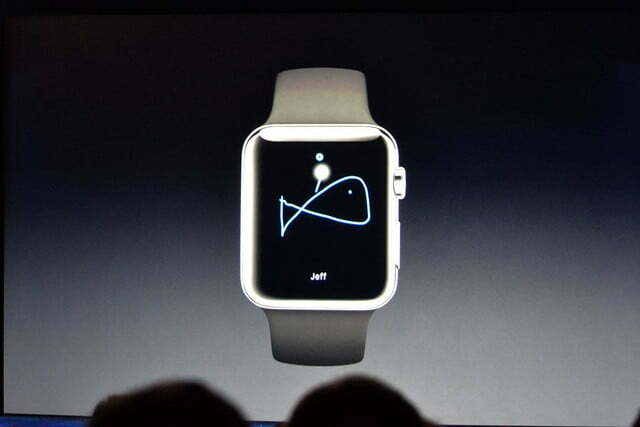 An accelerometer, Wi-Fi, and GPS are used to keep tabs on your movement during the day. 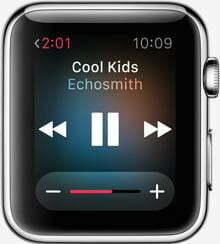 The user interface isn’t simply a smaller version of iOS, but an entirely new system designed for the small display size. 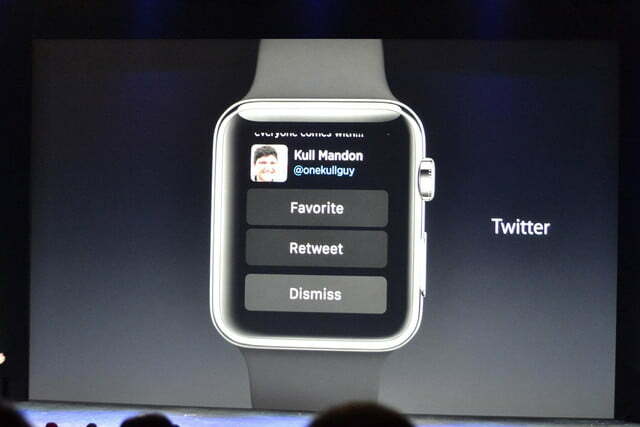 The OS pulls key phrases from messages to create quick replies, or you can add an emoji, and also dictate a longer reply. 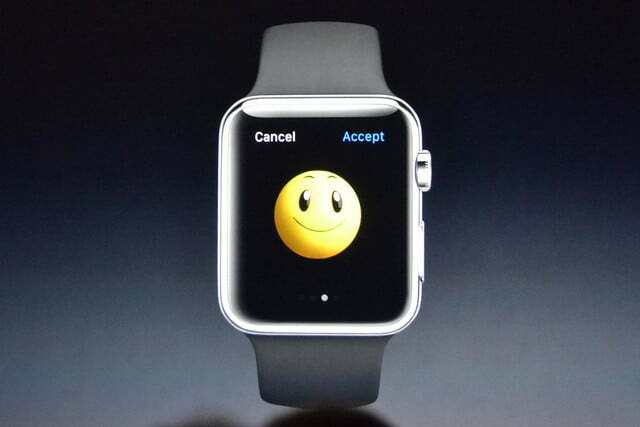 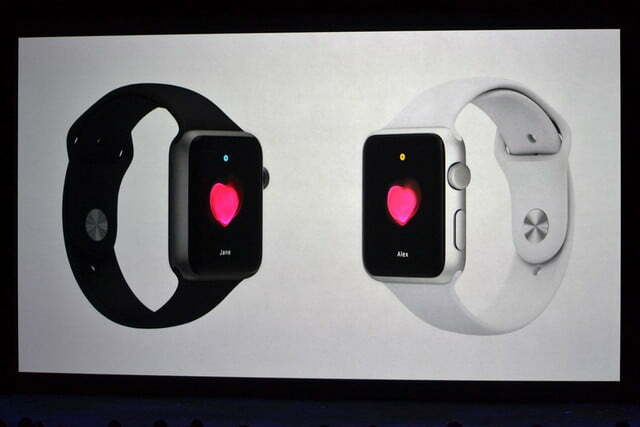 The emoji’s are completely customizable on the device, using the touchscreen. 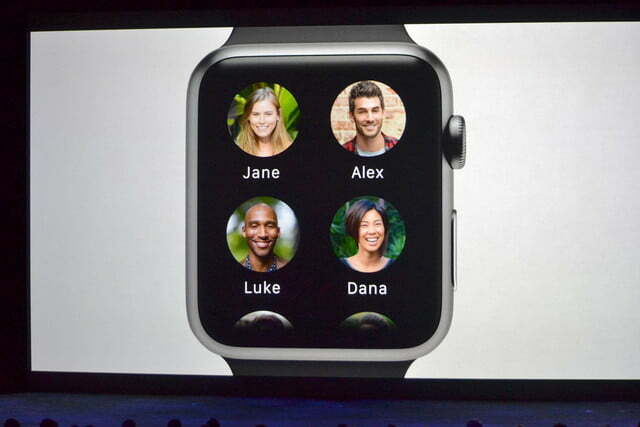 They’re even animated. 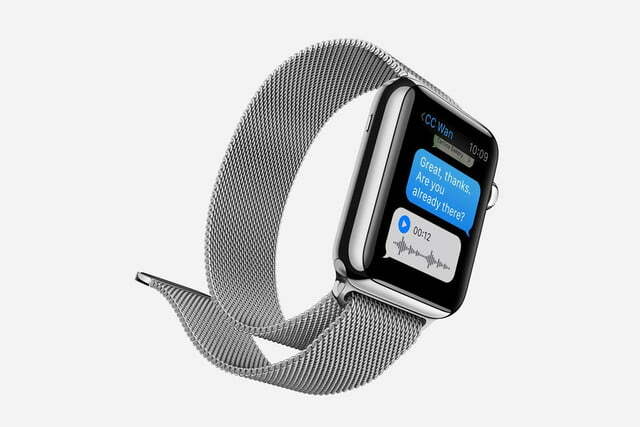 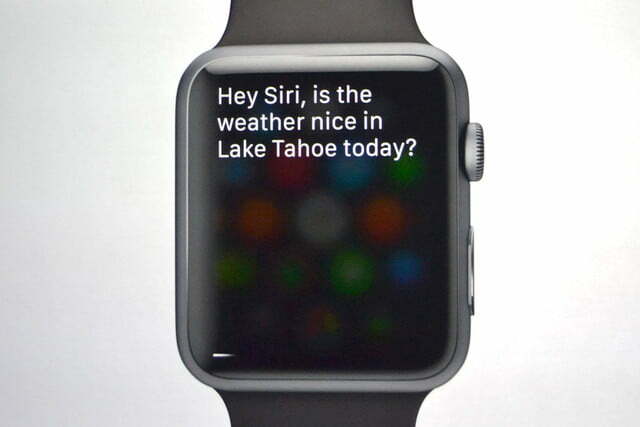 Siri can be accessed with a long press of the Digital Crown, and you can talk to the Watch just like you do with your iPhone. 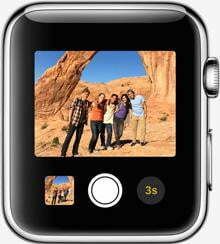 Favorite photos stored in iCloud can be viewed on the mini display, Apple Maps can be accessed and then controlled using the Digital Crown and the touchscreen in tandem, while Force Touch opens up contextual menus. 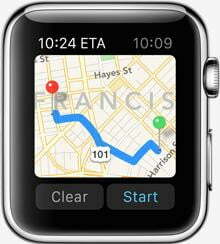 Options include walking and driving directions, the chance to call your end destination, and estimated time of arrival. 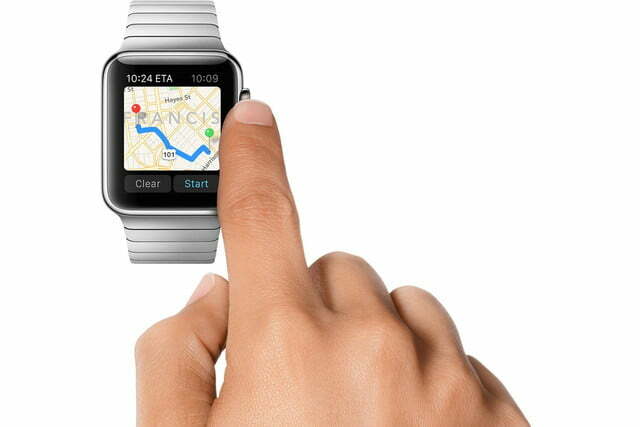 Direction-specific vibration alerts keep you heading the right way. 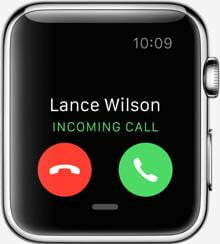 Developers haven’t been left out, and apps can send notifications to the Watch, which can be branded to match the phone app. 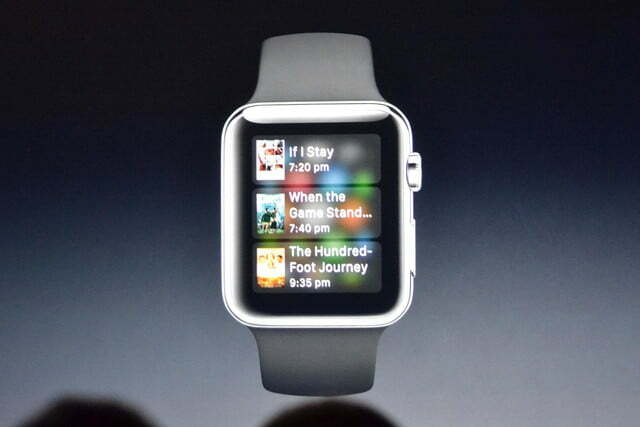 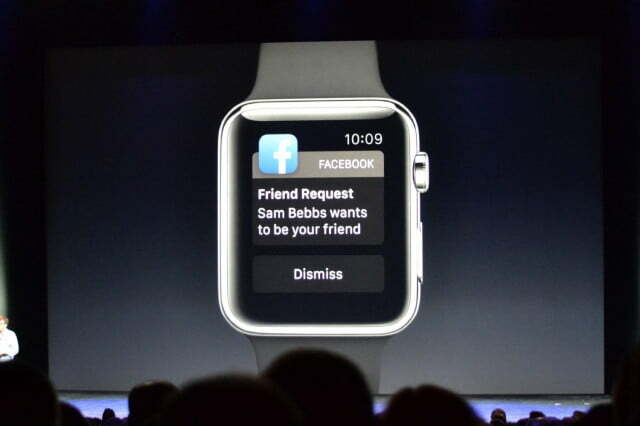 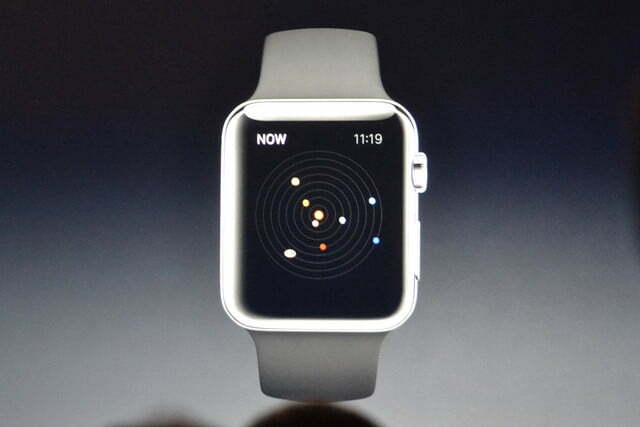 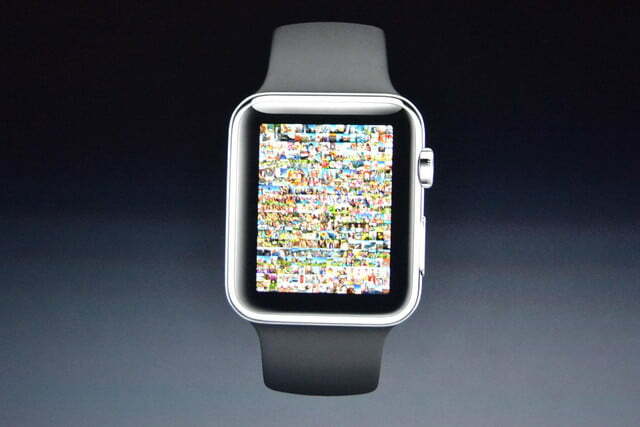 It doesn’t end there, because apps can use the Watch in some very interesting ways. 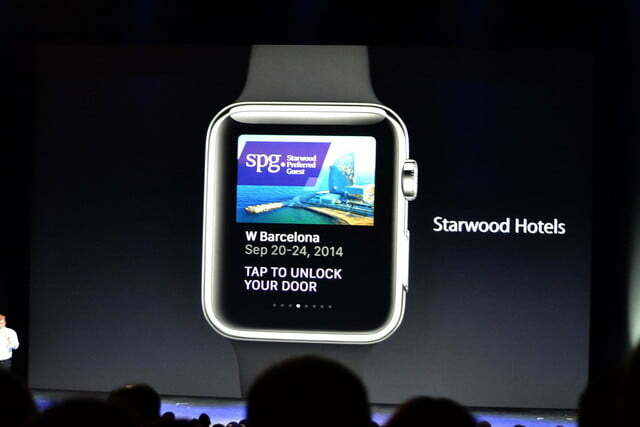 These include unlocking Starwood hotel doors (only your own, we hope), link up with BMW’s new electric cars to show battery charge and location details, and you can even challenge friends to go for a run through a Nike+ app. 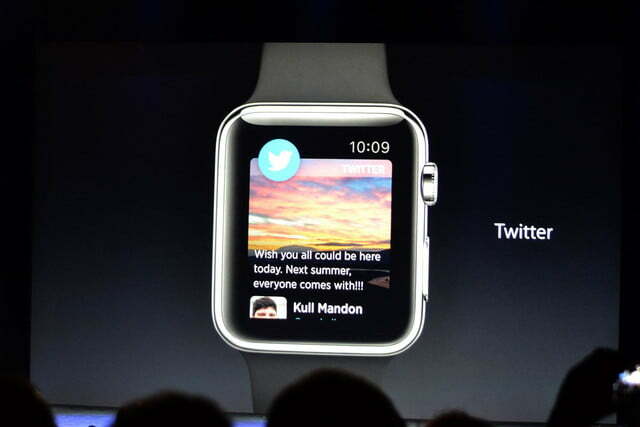 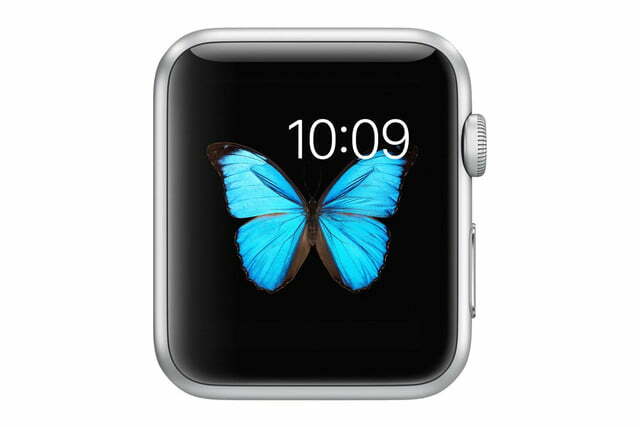 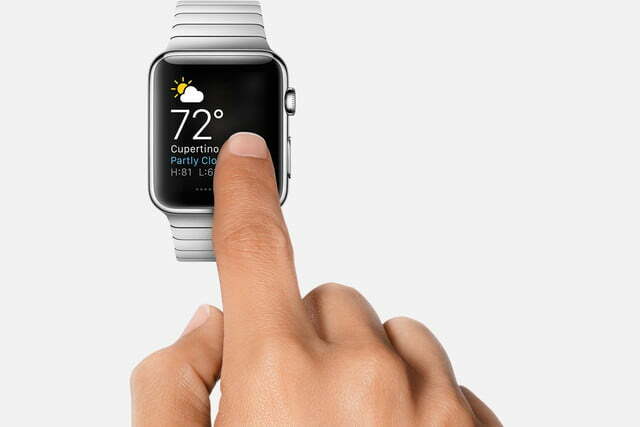 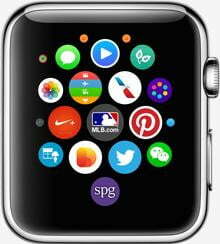 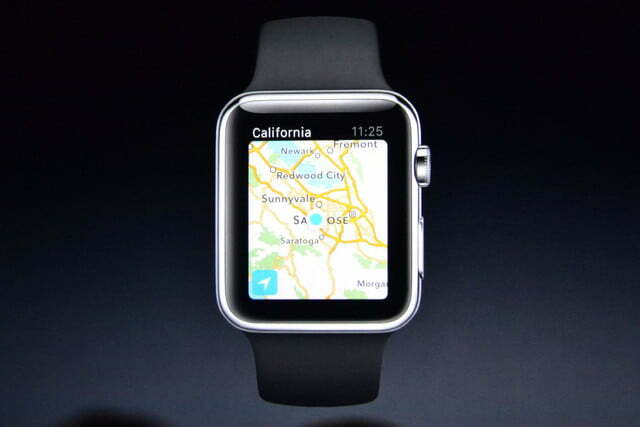 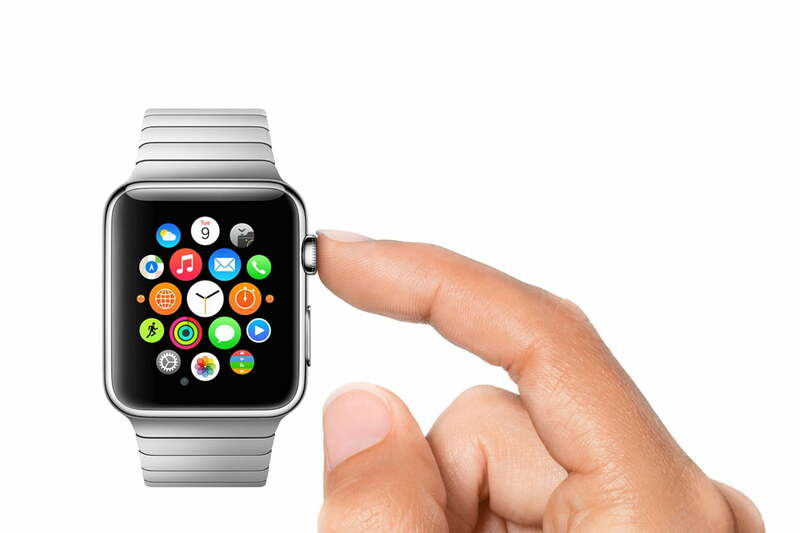 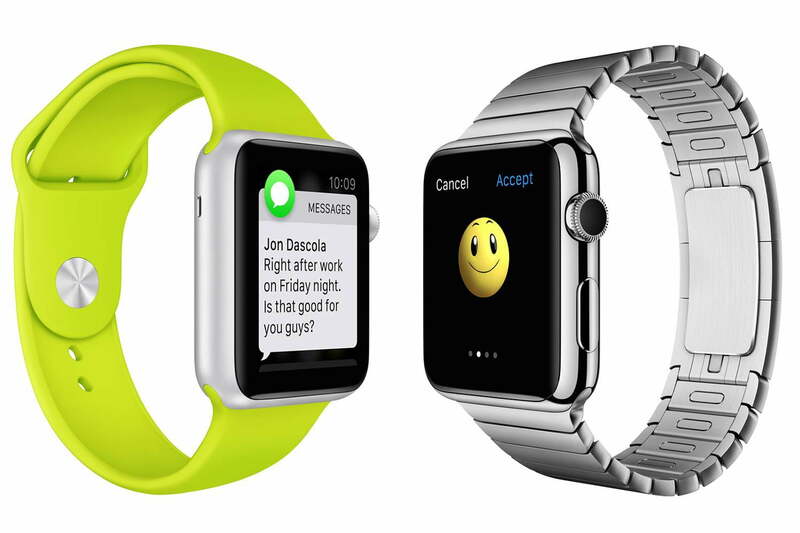 Apple says that in the future, developers will be able to write native apps for the Watch too. 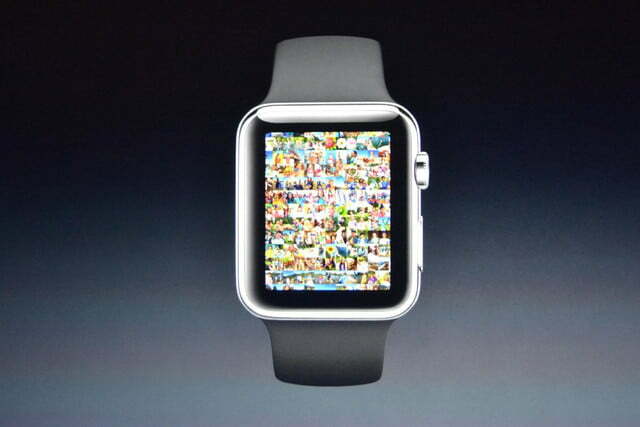 Other features include using it as a viewfinder for camera, and an Apple TV control. 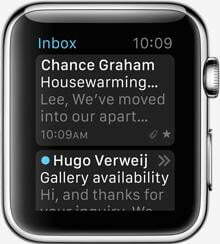 A Friends app keeps your favorite people in an easy to use list, while Handoff sees messages started on the Watch transfer over to the iPhone. 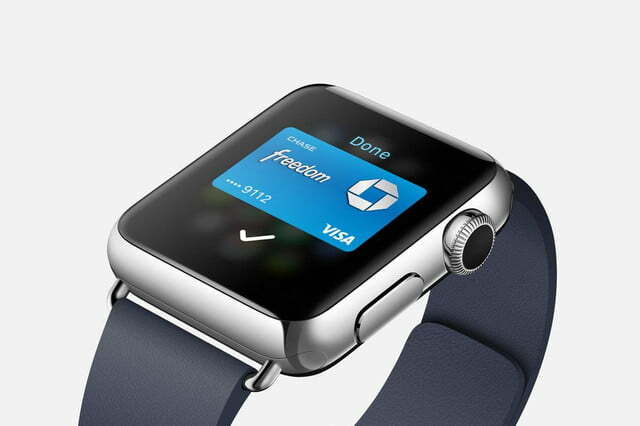 Passbook is ready to show your boarding pass and other tickets, while the new ApplePay wireless payments system works with the wearable device too. 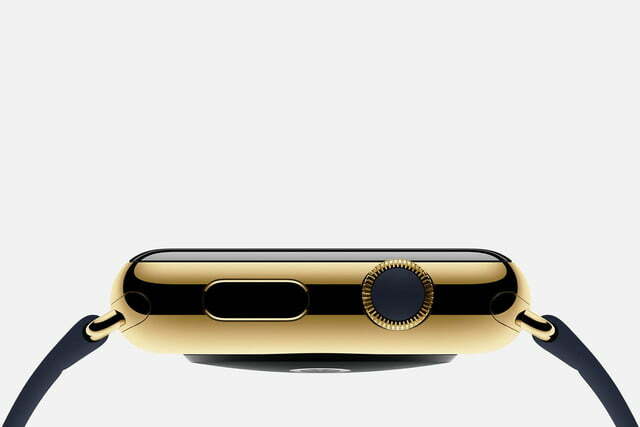 Apple hasn’t forgotten this is a watch either, and claims it’ll always be within 50 milliseconds of the global time standard, plus it’ll automatically adjust to the local time when you swap timezones. 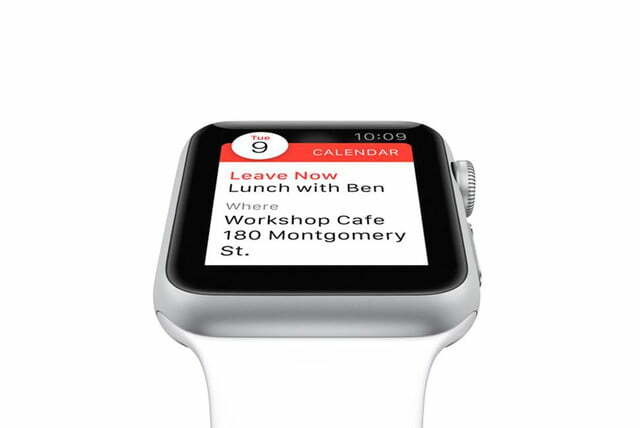 On the smartwatch side, it’ll deliver notifications, alerts, calendar entries, and let you answer calls, emails, and messages, all on your wrist. 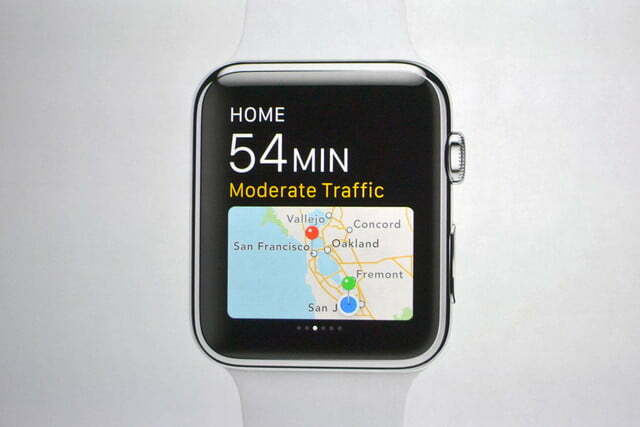 By using Glance, an upward swipe shows the weather, upcoming appointments, and your location on the map. 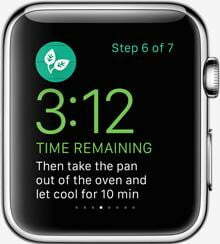 The Watch takes fitness seriously, and Apple has included several new apps to help your reach your goals. 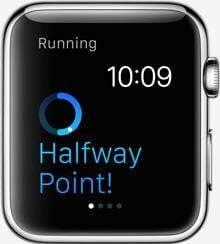 The Activity app is at the center, and uses a brightly colored ring to visualize how much you’ve moved, stood, and run around during the day. 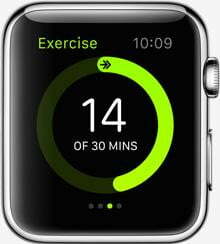 The more you use it, the more it’ll learn, and will set different goals each week to motivate you into getting fitter. 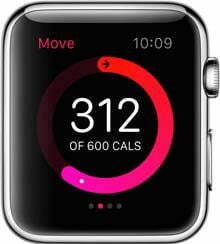 The rings show how close you are to reaching a daily target, which at its most basic, can be met by having 30 minutes of exercise each day. 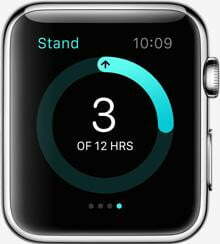 It’ll even remind you to get out of the chair and move about, right down to prompting you to just stand up once every hour. 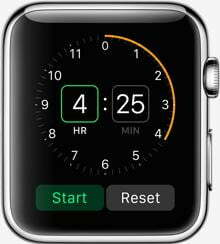 When you’re ready for something a little more vigorous, you’ll want the Workout app. This tracks a specific activity, and keeps a record of calories, pace, time, and distance traveled, depending on what you’re doing. 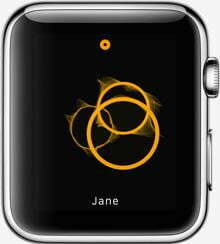 Like the Activity app, it’ll set goals for you, and there are awards and achievements to collect. 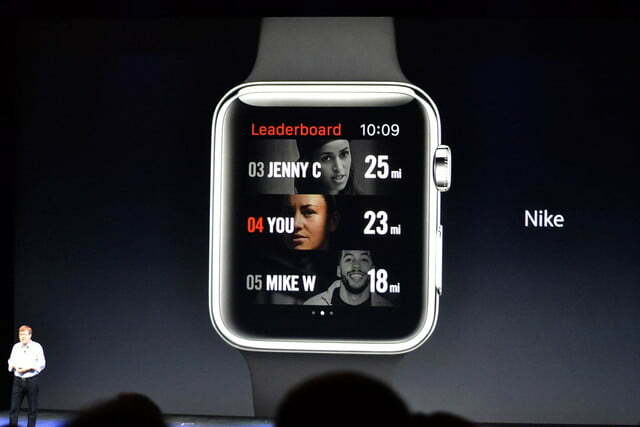 All this syncs up with the new Fitness app installed on the iPhone, which shows historical data. 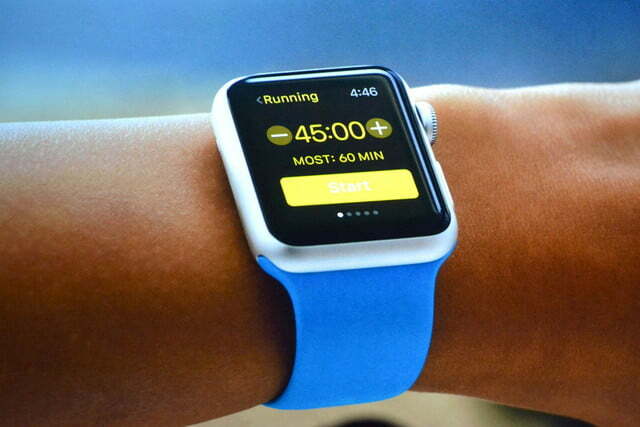 Finally, all this data can be shared with Apple’s Health app, and in turn, other health and fitness apps too. 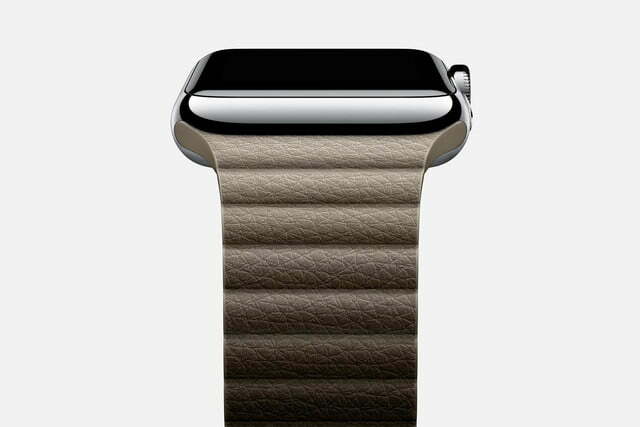 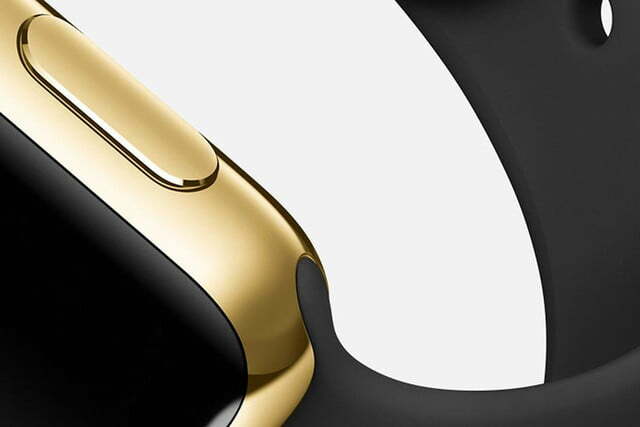 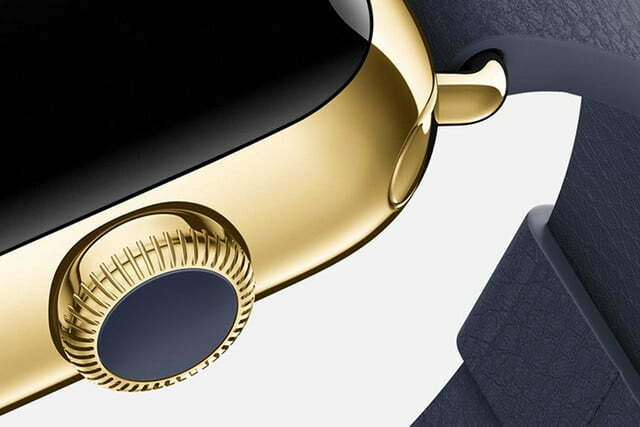 Apple may have shown us the Watch, but it’s not quite ready to release it just yet. 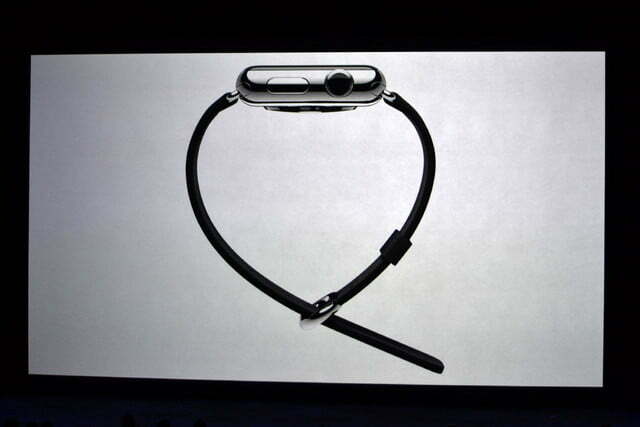 All we know right now is it’ll be out in early 2015, and the price starts at $350. 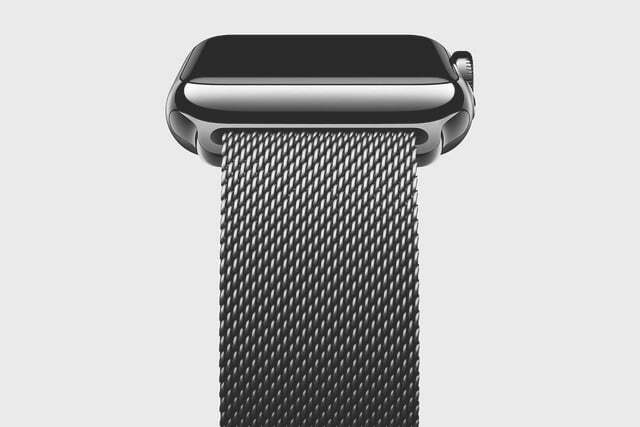 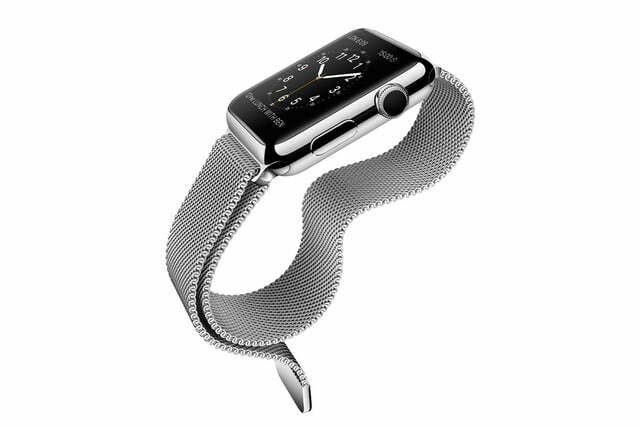 The good news is, the Apple Watch will happily link up with the iPhone 5, 5C, 5S, and the new iPhone 6 and iPhone 6 Plus. 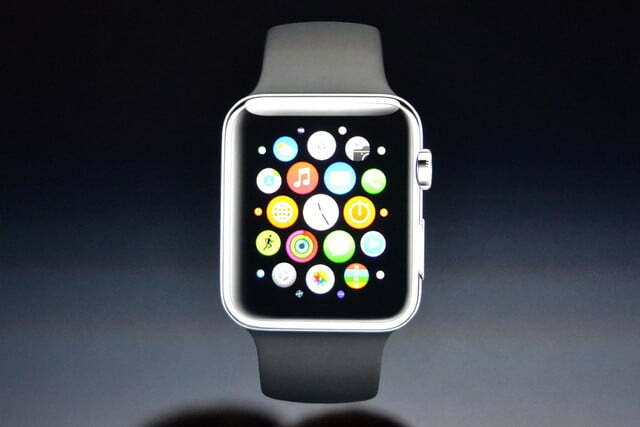 It’s an iPhone exclusive though, and won’t work with any other operating systems, and it requires iOS 8 to be installed.